So this is a quick follow on the previous post on coconut waffles – I do love my new waffle maker which makes breakfast amazingly quick and takes away all the guesswork of the done-ness of the waffle that my previous waffle maker put me through. 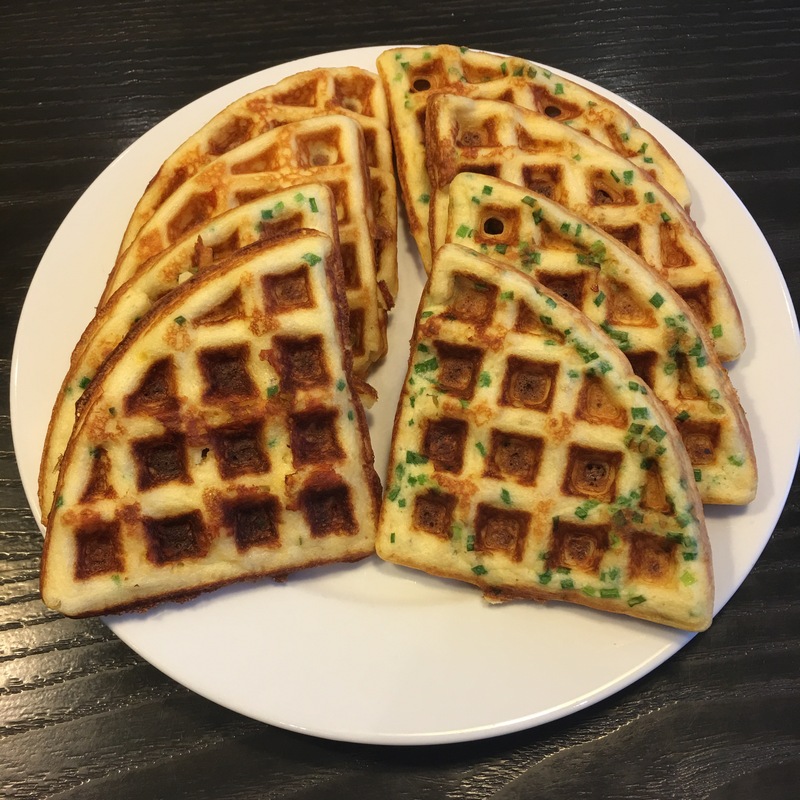 I do love savory waffles; in fact I’ve always loved savory more than sweet unlike kid #2 who lights up whenever there’s a cake or cookie around. Kid#1 probably has more of my taste preferences. I suspect that’s why he is also more demanding about having variety for his meals and he gives poor D, my helper, a lot of grief about getting a different breakfast everyday whereas kid#2 can live off a cup of milo every morning for months without needing a change. Anyway back to savory – I was really amused when we had Canadian guests recently and they couldn’t figure how Singaporeans could eat noodles, rice, porridge or prata for breakfast. I probably had a similar culture shock living in N America and watching people eating muffins for breakfast. Somehow, the savory and hearty is how local breakfasts seem to go, at least in the hawker centers here, where I see lines of people for their favorite prawn noodles, or bak chor mee (minced meat noodles). It is true however that most of us eat breakfast on the run, especially those of us with kids who need to make the school run at about 6 in the morning. Most times breakfast for me is just 2 eggs or a piece of low carb bread. So the waffles are a welcome change – super fast and easy and portable as well (they can be eaten on the go while driving!). Cook according to wafflemaker’s specifications. Serve hot.